Reno, NV – Thanks to a series of strong winter storms that have moved through the Lake Tahoe region one after another this season, Mt. 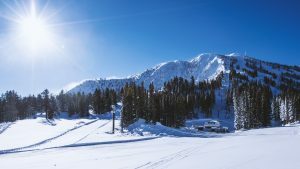 Rose Ski Tahoe has officially extended its ski and snowboard season and will remain open through Memorial Day, May 29. Reporting the most snow in North America to date this winter, 650 inches have already stacked up at the Lake Tahoe area resort thus far this season and average base depths currently total 223 inches on the mountain. The National Weather Service forecast calls for another winter storm system to move through the region over the coming weekend. Mt. Rose Ski Tahoe is open daily from 9 a.m. to 4 p.m., conditions permitting, and is offering midweek daily lift ticket deals including “Two ‘Fer Tuesdays,” $29 Ladies Day Thursdays, and discounted lift tickets valid any day of the season for active duty military. Spring skiing and riding is a little sweeter with the resort’s recent offering of its Spring Plus passes. Valid seven days per week with no blackouts this season or next, the Spring Plus Premier Pass is available for $695 for adults ages 24+, $495 for young adults ages 16-23, and $395 for children ages 6-15. The Spring Plus Midweek Pass is valid Monday through Friday, excluding December 25-29, 2017, January 15, 2018 and February 19, 2018, and is priced at $595 for any age.